Dianne graduated from Western with a BA in Graphic Design and has lived in Bellingham for almost 30 years. She's been on the Lithtex team from its beginning in 2002. 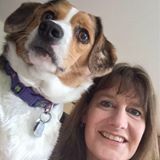 When she's not creating or troubleshooting in Adobe Suite, Dianne can be found hiking with her ball-crazy dog Roo or relaxing with her family and friends.